Chances are that if you’re reading this blog, you don’t need too much persuading to knit as a resolution, but just in case, here are five reasons that knitting is just what you need in the new year! Knitting is good for your health! According to an article in The New York Times, “the repetitive action of needlework can induce a relaxed state like that associated with meditation and yoga,” and that knitting “can lower heart rate and blood pressure and reduce harmful blood levels of the stress hormone cortisol.” Knitting also takes your mind off of other things like smoking or drinking, and can make people forget about stressful situations like recovering from illnesses. Studies show that knitting improves brain functionality and can possibly even stave off memory loss and “cognitive impairment.” These improvements were not found in people that took on other similar activities like reading or playing musical instruments. That’s a pretty strong argument to keep knitting if you ask me! The British Journal of Occupational Therapy released a study in 2014 that said 81% of survey respondents with depression said they felt happy after knitting, and more than 50% said they felt very happy. Another study by CNN called knitting a “natural anti-depressant” that releases dopamine. No wonder I think it’s so addictive! Psychiatrist Dr. Carrie Barron and her husband Dr. Alton Barron, an orthopedic surgeon travel America talking about the benefits of knitting, both mental and physical. According to the couple, knitting forces fluid towards your cartilage which keeps your joints hydrated, minimizing the risk of arthritis. Knitting makes you feel good! If you’ve ever knitted a project to completion, you already know that feeling of accomplishment! It’s what drives me to make my next project. Taking a ball of yarn (or many balls of yarn) and turning that into a hat or a scarf is such a great feeling! It also feels great to give someone else something that you made by hand, rather than just a store-bought gift. Are there any more reasons you can think of that make knitting the perfect activity to take up as a new years resolution? Leave your ideas in the comments! Last updated: December 23rd, 2016. Just five more reasons to keep on knitting and expanding my stash then! Have long known about the benefits of knitting – I call it my “sanity-saver” – has helped me through alien cultures, sudden bereavement, and all the other vicissitudes life has the habit of throwing your way AND one gets a sense of worth and productivity! This is amazing and so true! I can honestly say that I am addicted to knitting, and now I know why! I started knitting again to give up smoking,too. You really can’t do both. You also end up with wonderful garments!! Great article. Knitting is my new addiction! I’ve been a long time crocheter and still love it but recently re-learned to knit. There is something about watching (and feeling) those 2 needles move around each other, pulling up loops of yarn, that is so satisfying. It is truly a “sanity-saver”, as Jan called it in her comment. The more “boring” the pattern, the more I like it because it takes on a meditative quality to me. It’s a great way to relax before bed. Especially after a stressful day at work. I know I sleep better if I can knit a few rows before bed. I found that knitting has/had a therapeutic effect for myself and my autistic son. The rhythmic click clack of the needles had a calming effect on my son and as a result gave me a chance to “zone out” for a while too. He is now 19 but I still knit almost daily. I think I might be addicted. Just joined the group.You sound like a great bunch of people. Looking forward to hearing about your projects in 2017. I am making two blankets, two toddler jumpers,two mens’jumpers for birthdays and a pair of gloves.This should keep me busy for the next six months. Knitting keeps me away from the mall and random shopping that is mostly impulse buying. I have saved more money by keeping company with a great knitting project. That and coloring. I so agree – hand knitted garments are unique, each and every one of them. A perfect reason for carrying on knitting. Sitting in the sun on a cold winter day, with a great tasting coffee, knitting and listening to my favourite music from way back when I was a young adult. Now, that’s the good life! I am retired, and so I have all the time in the world. What a great way to spend the time!!! I’m a new knitter> I became ill late November ’16 and with 14 Grandchildren and their parents to buy gifts for I panicked because I was unable to leave home to do Christmas shopping. I found a free pattern on this Site for a Bobble Hat and a Scarf Collar. A friend purchased the wool for me and I knitted 15 Beanie Hats and 8 Scarfs. My knitting isn’t great but by the time I was half way through the knitting was becoming quite acceptable. Family loved them all. 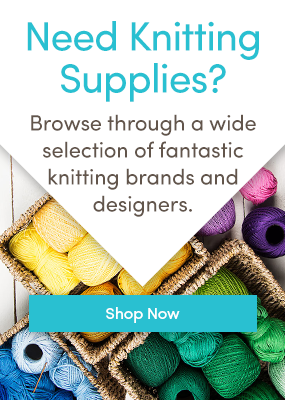 I’ve just discovered this blog, and it has inspired me to start knitting again and to finish a number of projects I’ve started and abandoned. Being creative does help keep depression at bay and give you a feeling of accomplishment, which I need to feel after retiring 14 months ago. I knew knitting would be good for me. And I am still learning. It is something I will love to do for the rest of my life. My ambition is to make a mermaids tail for some family members. Happy knitting everyone.